TWRP for "Team Win Recovery Project" is an application developed by TeamWin. This open-source utility offers the ability to restore Android images to compatible devices. Over the years, the utility has become a reference for Android users who regularly test alternative versions of the operating system on their smartphone. 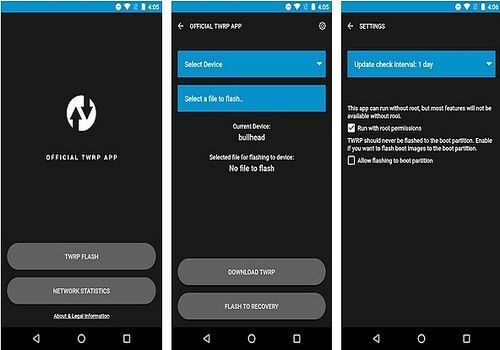 TWRP allows, for example, to install alternative versions of the OS while saving the current system of the device in a file, in order to restore it in case of problems. In addition, TWRP is also able to securely delete the system cache, or the entire system of the device and its data. It is therefore necessary to be careful when using it and constantly make backups. Regarding its technical aspects, please note that the application can work without root. However, some of its features require a root of the device. ApowerTrans is a mobile application for transferring data between smartphones. The transfer is made between mobiles of the same system (Android-Android or iPhone-iPhone) and even mobiles under different systems.